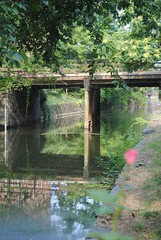 Time moves at the speed of light when you’re busy living life, so it will surprise you all that’s in been almost a year since the DDOT embarked on Operation: Remove, Restore and Replace Georgetown’s C&O Canal Bridges. Next up is the renovation of the much beloved Thomas Jefferson Street Bridge scheduled to kick off on July 28th and last approximately one year. While two-way traffic will still be permitted between M Street and Thomas Jefferson Street Bridge and between K Street and Thomas Jefferson Bridge, what about crossing the canal to get coffee and cupcakes at Baked & Wired?!!! I’m very concerned that my afternoon sugar rush will be sorely impeded and inconvenienced. On the up side, some extra walking will help make up for these sweet indiscretions. Wait! Tom Bridge will be closed? They built a (scary) metal bridge near the 30th Street span for pedistrians while the actual bridge was closed. Hopefully they will do that on TJ, too. That metal bridge on the Canal between TJ and 30th Streets is quite precarious, but I’ll definitely use it if it means better cupcake/waterfront access.